This is Toffee. She's 16 (or so). 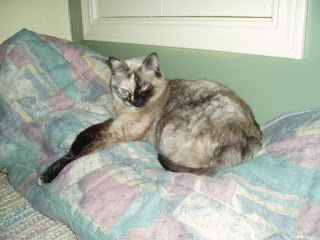 She was a bully in her younger days, although she's become the victim as she has aged in a house with five other cats. She chews her food, and her jaw makes startlingly loud grinding noises while she does. She loves to be petted, her meow sounds like nails on chalkboard, and she wets outside the litter box when she's upset. I try very hard not to upset her. She is wired wrong in the head. Her eyes don't work quite right, although that doesn't stop her from climbing The Heights. She's the cat who fell on me and my burrito one lunch hour last year. The scars are still visible on my right hand. Like all animals that aren't wired quite right in the head, she has enjoyed remarkable health. No tartar, no diseases. She even missed out on the flea epidemic of 2007. A week ago, she stopped eating. Well, not stopped, exactly, but her volume fell to maybe 20 nuggets a day, 5 per meal. 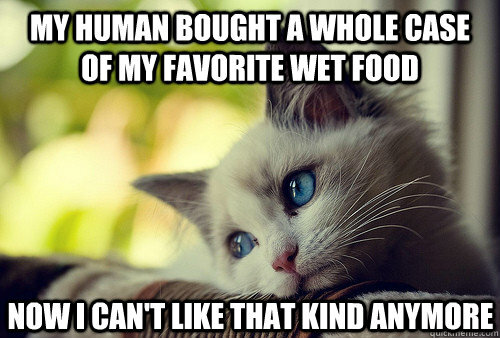 Cats, unlike dogs, will not eat when they get hungry enough. If they stop eating, they don't start again, their livers shut down, and they die. It's a mess. I had a can of wet food left over from someone else's momentary freak out, and she ate it. I had that conversation with myself that no one thinks I have: the "am I willing to do X or is X too crazy/not worth it?" argument usually had between spouses. I drew my line and got more wet food. Being a cat, she stopped eating it as soon as I got a two-week supply. I learned she will eat it - as long as I sit right beside her and pet her the entire time. This morning was 40 minutes to eat a third of a can. To maintain her weight, she needs a can and a half a day. This is ridiculous. I cannot spend an hour and a half each day coaxing a 16 year old, ashamed-to-admit-not-my-favorite-cat to eat. I have been less than patient the last couple of days while I again had that "am I willing to do X?" argument with myself with new parameters. It's not like I just have to be in the room (the separate room closed off from the five other protesters living in this house who also want the new food stuff). I literally have to sit quietly next to her while she licks the bowl clean, petting her when she slows or gets restless. However, the one other thing I can do during those times is pray. I can pet while I pray, and I certainly have an hour and a half's worth of things to pray about lately. We go to see the vet Saturday to make sure there isn't a medical reason for this. I suspect it's the stress of too many houseguests too close together that threw her off, and I should be grateful she's not wetting outside the litter box. I can't do this forever, but I can do it for a while. Long enough to see if she'll pull out on her own or is just ready to take The Long Step. Just call her The Prayer Cat.